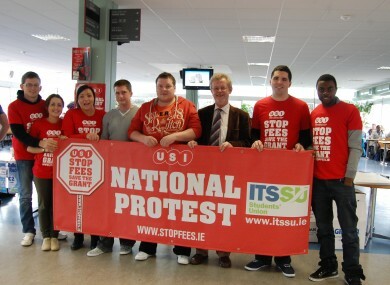 Nearly 600 students from IT Sligo are expected to join the march today. AS MANY AS 20,000 students as well as their parents and families are expected to march in Dublin today to protest against the possible re-introduction of third-level fees. Crowds will gather at 12.30pm in Parnell Square and will march to Government buildings where they are expected to arrive at 2.30pm. The Union of Students in Ireland (USI) says that nearly 200 buses will carry students from college campuses across the country to the capital to participate in the march. As well as protesting against the re-introduction of fees, students will march against any possible additional cuts to student maintenance grants in the forthcoming Budget. Over the weekend it was reported that the Government was considering scrapping post-graduate grants in a bid to save €50 million. USI president Gary Redmond has urged Education Minister Ruiarí Quinn to honour his pre-election promise as the Labour Party’s education spokesperson to oppose any new form of third-level fees if in government. Ireland is tragically losing the future drivers of our Smart Economy, with thousands of valuable graduates having already left Irish shores and many thousands more preparing to follow suit. There are currently three choices for young Irish people – college, emigration or the dole. Any increase in college fees or additional cuts to student supports will ensure that a third-level education is not an option for thousands of young people across the country. The credibility of the Coalition Government and its political parties is under the spotlight on this issue and the USI is vigorously campaigning to ensure that pre-election pledges are honoured. Speaking on RTÉ’s Morning Ireland he insisted that the current education system provided “excellent value for money” for the government and further urged no increase or re-introduction of fees. AA Roadwatch reports that due to the march it expects Kildare Street and Nassau Street to close and restrictions to be in place on Merrion Square, Clare Street and on other streets in the vicinity. Motorists are advised to avoid the area if possible. Email “Thousands of students expected to march against fees ”. Feedback on “Thousands of students expected to march against fees ”.